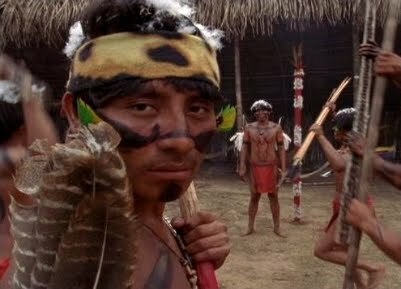 Yai Wanonabälewä: The Enemy God is a feature-length dramatic motion picture set in the Amazon rainforest. The film gives voice to a group of indigenous rainforest people to relate their own dramatic story. The film is made in partnership with Yanomamö communities in Amazonas province in the rainforest of Venezuela and proceeds from the film will go to benefit those communities as directed by Yanomamö leaders. Yai Wanonabälewä: The Enemy God began with a request from a group of indigenous Yanomamö (or Yanomami), in order to find somebody that would allow them to tell their version of the history of their communities in the Amazon rainforest. After years of violence and fear, they want to tell the world about the new ways of peace and hope that they have discovered for their people. It is the story of a significant group, led by a respected headman whose Spanish name is Bautista. It is a true story. Bautista Cajicuwa and his K'ekchi' fellow villagers acted as themselves in the film. •See the self-determined transformation of an indigenous culture while preserving and honoring their uniqueness in their Creator’s eyes. •Hear from and meet leaders from indigenous groups in the Amazon and other regions. •Discover opportunities to partner with indigenous groups through short & long-term service, training, and advocacy. •Partner with individuals an organizations dedicated to the empowering of indigenous groups all over the world.